In the Pacific Northwest, practically speaking, we have two types of termites to look out for on inspections. And, if you are in the Bellingham area, despite the propaganda you might hear to the contrary-- Yes, we too have termites! The first, and uncommon in most parts of the country, is the Pacific Dampwood termite. Here in the northwest we see this insect fairly often. This guy, and the gals, are attracted to very moist, often decaying, wood. They are a secondary problem in that wood is way too wet to begin with if they find it appealing, so you have a problem even before they move in. They are often found around plumbing leaks, in wet crawl spaces, that kind of thing. Unlike the subterranean termite, the dampwoods often live in the wood they feed on. Tearing out the old lumber and getting rid of the moisture will eliminate this species without a costly chemical treatment. The second species, and harder to eradicate, is the Western Subterranean termite. This is the classic termite, a real termite among termites, that lives deep in the soil and then uses mud tunnels or tubes to commute up into structural lumber. Like almost all termites, they are seldom to never visible to the homeowner. To find the subs a trained professional needs to do a crawl space inspection looking for telltale signs. This pest almost always requires a chemical treatment such as sodium borates and is more common east of the mountains. The third species, is the stranger among us -- at least here in Washington State it is a stranger. It is rare and an import from warmer climates, probably just another Californian moving to the northwest. 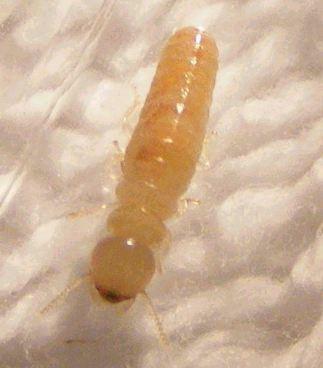 This pest is the drywood termite. This termite, in my region, might be found in furniture that was imported from other parts of the country. The photo below was supplied by AR ace Charles Buell and, some time back, I wrote a blog on the specifics of Charlie's amazing capture. You might want to check it out. So far, this guy -- the drywood termite not Charlie -- is a visitor but there is some concern that, over the years, it might adapt to our climate. Because this termite can live in wood, and does not go out searching for sources of water, it does not leave mud tubes -- it usually stays hidden and nice and dry. In the northwest, when a drywood termite is identified, the furniture should be removed from the home and treated by a professional. In warm climates these guys are a main reason for tent fumigation of the home. If you think you know lots about wood destroying organisms, or you want to find out what you know, you can take my free online test it scores you on the spot and is quick and interactive. Photos of the species are below. The bigger termites, left photos, are called soldiers. 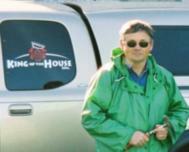 Blaine WA Home Inspector (King of the House): Oh Rats!